Add all ingredients (except for chocolate chips) to a good food processor , and blend until very smooth. Then mix in the chocolate chips and oats. Form cookies and lay them on a baking sheet. Cover with plastic wrap and allow it to chill in the refrigerator for an hour or 2. 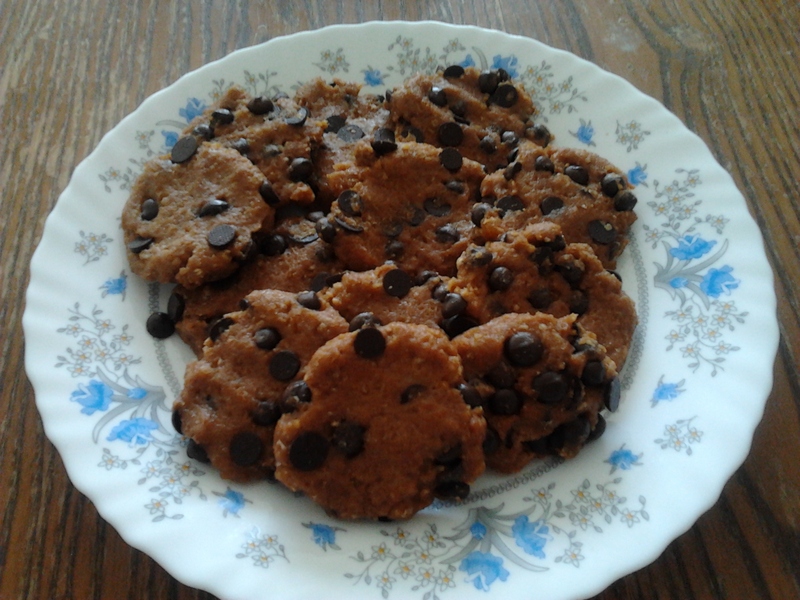 This entry was posted in Desserts, Vegetarian and tagged no-bake chocolate chip cookes, no-bake desserts. Preheat oven to 425° F. Lightly spray a shallow-sided sheet pan, large enough to hold the vegetables in one layer, with cooking spray. Place the peppers, onions, eggplant and mushrooms on the pan. Drizzle with the olive oil, adding a little more if needed to lightly coat. Add the garlic, thyme, oregano, salt and pepper. Toss well to combine. Roast until the vegetables are tender, about 30 minutes. Meanwhile, halve the rolls horizontally. Remove some of the extra bread from the centers of both halves to form a boat. Place under the broiler, cut side up, and toast slightly. Spread each half with a little hummus and a bit of schug. Put a generous amount of the vegetables in the bottom halves. 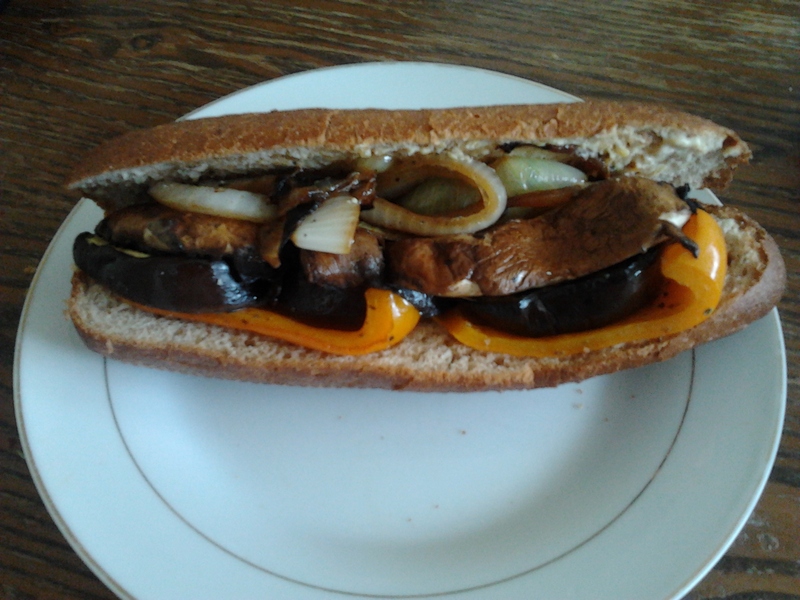 This entry was posted in Bread, Vegetarian and tagged bell peppers, eggplant, hummus, onions, portobello mushrooms, schug, vegetarian submarine sandwich. Pasta and cheese normally go well together like a marriage. I have a bad habit of drowning my pasta or grains with cheeses or sauce. Who can resist a bowl of pasta with gooey cheese? I barely could. I’ve been trying to keep my temptation for cheese in check. I’ve used a bit of veggies, mostly mushrooms seasoned with herbs as a healthier alternative to cheese and heavy sauces. This lemony herb linguine is a vegan solution to any of my favorite dairy ridden pasta dishes. A bit of lemon zest adds from freshness and a semblance of Spring to this linguine dish. Mushrooms, fresh basil, and baby spinach give this dish some flavor as well as balance. You can use other vegetables as well such as tomatoes, peppers, or zucchini. You can throw is some tofu or fish for some protein. Add some pecans (not the candied ones) to this lemony herb linguine for some crunch. When using linguine, whole wheat linguine is a healthful choice. I haven’t given up cheese for now. This experience has taught me that butter, cheese, heavy cream, and milk are not crucial to creating a creamy yet flavorful pasta dish. For parents who are struggling to encourage their kids to eat more vegetables, this recipe may be your saving grace. Cook linguine according to package directions. Meanwhile, in a large skillet, saute the, mushrooms, onions and garlic in a greased skillet for 3-5 minutes. Add the spinach, basil, oregano, salt and pepper; cover and simmer for 3 minutes. Drain linguine; add to vegetable mixture. Toss in lemon zest and pecans (optional). Season with salt and pepper. Top with parsley. 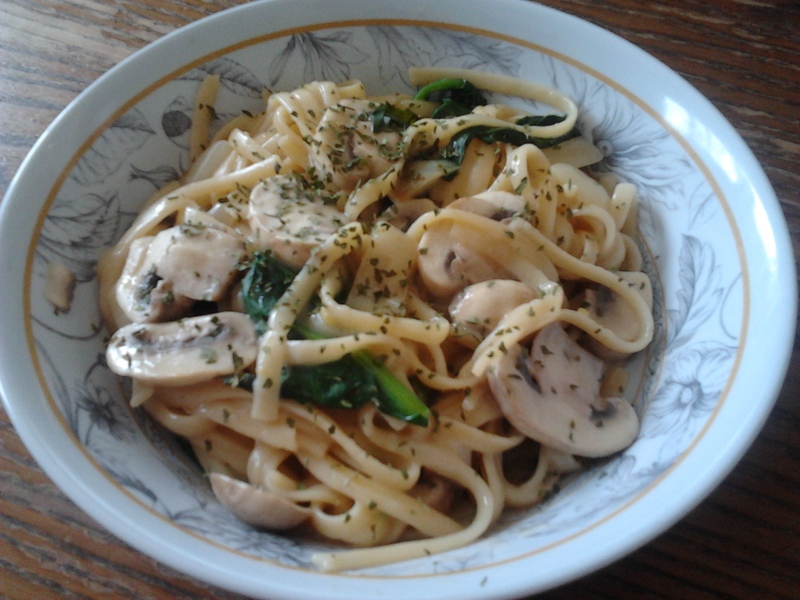 This entry was posted in Side Dishes, Vegetarian and tagged baby spinach, fresh basil, herbs, Lemon zest, lemony herb linguine, Mushrooms, whole wheat linguine. Turkish chicken is similar to Tandoori chicken in terms of using a yogurt marinade. Rather than using drumsticks, Turkish chicken requires chicken breasts. And there is no curry. The acidity of the yogurt and lemon juice helps tenderize and keep the chicken breasts moist. A bit of hot paprika or cayenne pepper adds some kick to this Turkish chicken. Due to my dietary restrictions, I am unable to use dairy yogurt wit this chicken and non-dairy yogurt is hard to find where I live. I used soy milk instead which worked just as well. Like Tandoori chicken, Turkish chicken requires at least an hour of marination. Turkish chicken serves well with grains and pasta. You can serve each chicken breast whole like I did or cut them up into pieces. Although not necessary, I added some sauted onions to this chicken. If you decide to cut them up, reduce the cooking time as chicken breasts are vulnerable to drying out very easily. Stuff leftovers in a pit with some salad. Pound and butterfly chicken breasts. Place chicken breasts in a bowl. Add lemon juice and toss to coat. Whisk soy milk, garlic, ginger, paprika, cumin, mint, salt and salt in a separate bowl. Pour the yogurt/soy milk mixture over the chicken and stir to coat. Cover with plastic wrap and refrigerate for at least 1 hour or up to 24 hours. Position rack in upper third of oven; preheat broiler. Remove the chicken from the marinade. Place the chicken on a broiler rack and broil until browned on top, about 15 minutes. Reduce oven temperature to 400°F and bake until the chicken is juicy and just cooked through, about 15 minutes longer. (Thigh meat will appear dark pink, even when cooked through.) Serve immediately. This entry was posted in Gluten Free, Meat and tagged chicken breasts, cinnamon, cumin, fresh mint, lemon juice, soy milk, Turkish chicken. Whenever I think of beets, borscht is the first thing that comes to my mind and not in a positive way. As a matter of fact, the word beet makes me grimace. 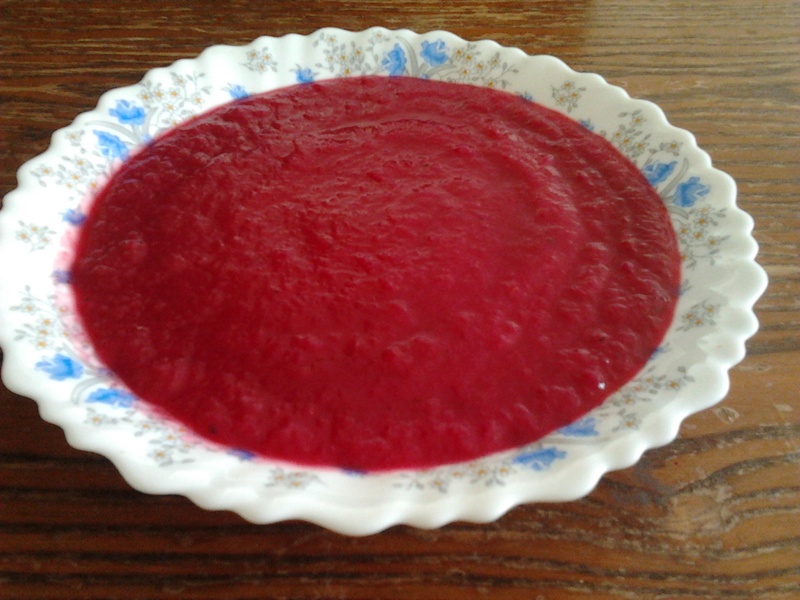 My maternal grandmother, God rest her soul, would live on this cold Russian beet soup every Passover. After having a couple sips, I couldn’t fathom why. Most Russians I know and those from the Soviet Union claim that my dislike for borscht stems from the processed canned stuff which everyone unanimously agrees is total crud. Having root beet soup at a friend’s house slightly made me have a change of heart. Honestly, I was a little hesitant to try it when she mentioned that she was serving this soup. Just out of morbid curiosity, I tried a bit of it and it wasn’t as bad as I was anticipating it to be. It was actually downright good enough for me to want to replicate this soup. I forgot to ask for the recipe but decided to improvise my own version based on the ingredients I was able to memorize. Beets are bland when eaten alone. A bit of tomato paste and balsamic vinegar adds some kick to this soup. When made right, this root beet soup is rich and velvety. I especially love the deep purple and red hue. Place all ingredients in a stock pot. Fill it up with 4 to 6 cups of water or vegetable stock. Cover and bring to a boil. Uncover and let it simmer for 30 minutes or until vegetables are soft and tender. Puree with a hand blender or in batches with a blender. Season with salt and pepper. This entry was posted in Gluten Free, Soup, Vegetarian and tagged balsamic vinegar, beets, Celery, leeks, potatoes, root beet soup. If you have been to a Middle Eastern theme party, you will notice an array of spiced spreads from hummus, eggplant spreads to tahini and more. Most Middle Eastern cuisine is by in large spiced with cayenne pepper, cumin, tumeric, chili peppers, and jalapeno peppers. Unlike my previous dips, making this schug does not require prior cooking or roasting. This Yemenite spicy relish, or schug, is basically made with raw chiles, garlic, jalapeno, cilantro, or parsley. Schug is comprised of 2 different colors – either bright green or brick red, depending on which pepper you decide to use. I initially intended to use a bit of both but couldn’t find chili peppers as they were sold out by the time I went to look for them. Instead, I’ve used a red bell pepper and a bit of chili oil along with jalapeno pepper and garlic. Unless you have an iron stomach or a fire-proof palate, schug is not meant to be eaten in copious amounts. Its flavour, even in the smallest amount, can be very fiery from a miniscule amount of dried chiles to black pepper. While schug is spicy, it is one of the easiest dips to make. I find jalapeno peppers not to be as overwhelmingly pungent as chili peppers but you can use hotter chili peppers if you prefer. Yemenites serve this spicy relish as an accompaniment for soup. 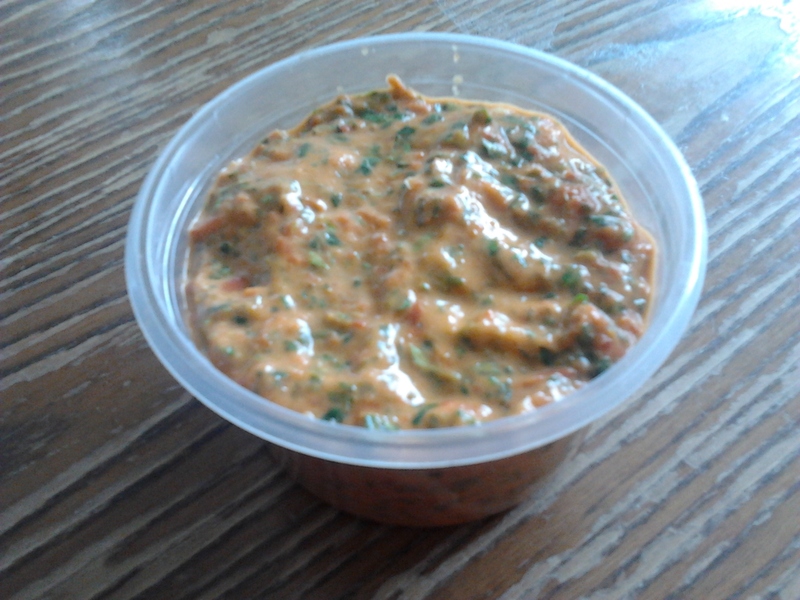 Most people usually spread this Yemenite spicy relish on bread or pitas and eat it with the soup. Others like to add it to their pita and felafel. I like to add a bit of it to my salad or use it in a sandwich. Indeed, you can use it like pesto and mix a small amount of it with pasta and add a little olive oil. Or you can use it as a marinade for chicken. Since schug is easy to prepare, I generally make it in small quantities so the flavours stay fresh. You can remove the seeds and membranes of jalapeno and chili peppers for mildler effect but I leave them in so they give their heat to this spicy relish. Since cilantro gives plenty of flavour to the relish, I use them. If you don’t like cilantro, however, you can always substitute them for flat-leaf parsley instead or omit them entirely. Combine jalapeno peppers, red bell pepper, garlic, chili oil, cilantro, 2 teaspoons of water and salt in a mini-food processor. Process ingredients into a smooth puree, stopping every few seconds to push mixture down so ingredients are grounded evenly. Add a bit more water if necessary. This entry was posted in Gluten Free, Sauce, Vegetarian and tagged chili oil, Garlic, jalapeno peppers, Middle Eastern, red bell pepper, schug, Yemenite spicy relish. Most people associate cheesecake with dessert. They will seldom think of it as as a savoury side dish. Truth be told, a savoury cheesecake isn’t much different than a quiche, per say. As a matter of fact, this spinach broccoli goat cheesecake recipe is practically a vegetable crustless quiche. 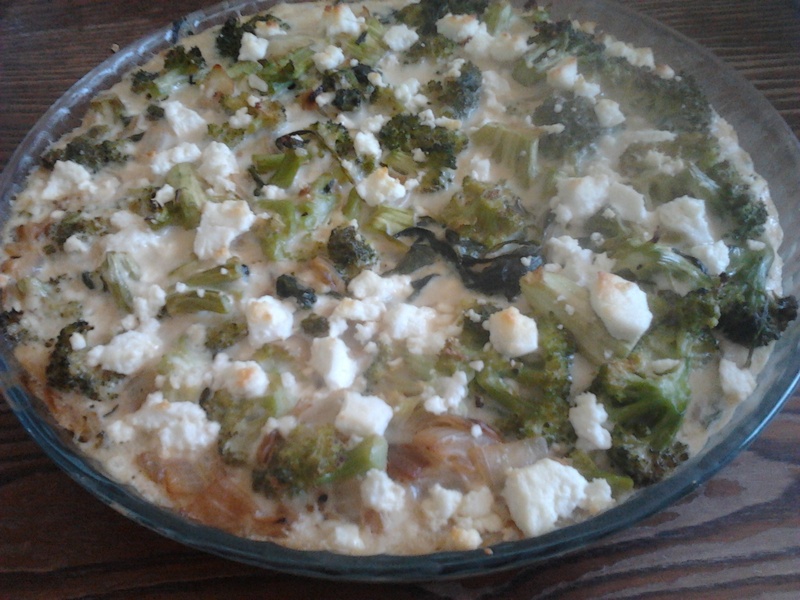 I merely sauted the vegetables, used 2 eggs and cottage cheese for the filling, and used goat cheese as a topping. I normally enjoy quiches with the crust but I figured that I could make some sacrifices on the excess amount of oil and butter fat that is normally embedded in most pie crusts. It doesn’t necessarily need it. Leftovers make great breakfasts. If you use the salty goat cheese, however, I do recommend that you use additional salt very sparingly as too much can overpower the flavour of this savoury cheesecake. Preheat oven to 350 degrees F. Grease a 9 inch pie pan. Saute onion in a greased skillet over medium high heat for 5 minutes. Saute garlic for another minute. Add the spinach and broccoli florets and saute till soft. In a bowl, mix pepper, eggs and cottage cheese. Pour in vegetables and mix well. Transfer to pie pan. Bake for 30 minutes. Sprinkle crumbled goat cheese and bake for another 5 to 7 minutes or until browned on the edges. This entry was posted in Breakfast, Dairy, Vegetarian and tagged broccoli, cottage cheese, crustless quiche, goat cheese, savoury cheesecake, spinach.